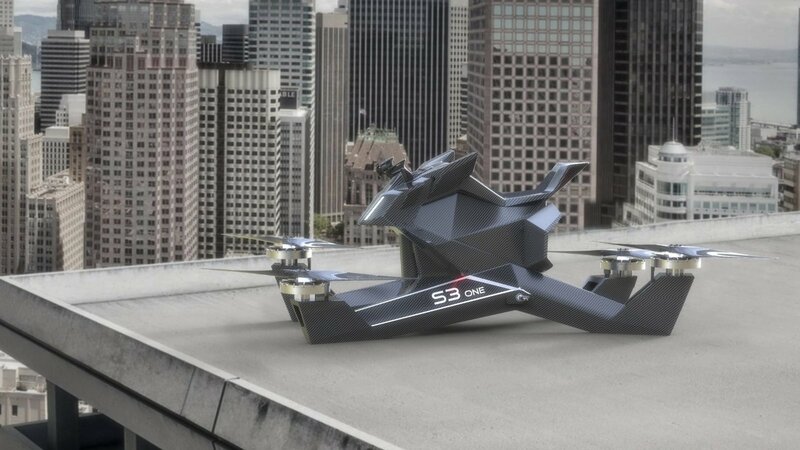 What is the Hoverbike S3? According to the company, the Scorpion-3 Hoverbike’s frame was created using different types of carbon fiber technology. It relies on four heavy-duty propellers to fly and weighs around 253 pounds. The Scorpion-3 can hover 16 feet above the ground and can seat (fly?) one adult rider. This Hoverbike can travel up to 60 miles per hour and can stay airborne for 10-25 minutes, depending on the weight of the flyer and weather conditions. The Hoverbike Scorpion-3 is offered with a new hybrid lithium-manganese-nickel battery that allows riders to fly up to 40 minutes in “drone mode.” The ergonomics of the pilot’s seat have been improved on the new model to allow better comfort. Coming to the safety features, the list includes auto-stabilizers, auto-takeoff, auto-landing, and an electronic safety system. The electronic safety system includes emergency landing, a sound and visual warning system, and anti-interference screening. Body: monocoque frame made of different types of carbon, the whole frame is made by a single element, which gives the stiffness of the structure by forming spatial stiffeners, and a weight reduction of 2 times compared to the aluminum frame of the previous model. Ergonomics: hoverbike design allows it to be rolled through a standard doorway while being able to take off and land from an ordinary parking space. The Hoverbike Scorpion-3 2019 can be reserved by making a $10,000 deposit. It will take two to six months for it to be delivered. And yes, the Hoverbike is a limited edition; although the company did not mention how limited the run would be. Do you think the Hoversurf Hoverbike Scorpion-3 will actually sell well and is a feasible form of personal transportation? Let us know your thoughts in the comments section below. Next Next post: Think Drifting in Your Mustang is Cool? Try Horse Drifting!